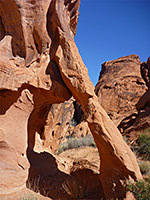 Maintained hiking routes in Valley of Fire State Park are limited to short trails to viewpoints or rock formations, such as Elephant Rock near the east entrance, Silica Dome along the northern spur road and the White Domes, at the end of this road. The most popular is the 0.4 mile hike to Mouse's Tank, a pothole that holds water for several weeks after rainfall and is situated in a pretty, red rock gorge (Petroglyph Canyon), whose walls are lined with hundreds of petroglyphs. The official trail ends at the tank but the canyon can be followed downstream as far as desired, either for 4.3 miles until it intersects Highway 169, or just for 2.8 miles, beyond which the drainage opens out and becomes less interesting. Between here and the tank are several short and pretty sections of shady narrows, interspersed with a few big chokestones and dryfalls, but without any great obstacles. The rocks in this section of the state park are uniformly dark red in color - the brighter pinks and yellows are only found further north - though the narrow, water carved parts of the canyon are somewhat lighter orange/red, and quite photogenic. 21 views of Fire Canyon Wash; gallery, slideshow. 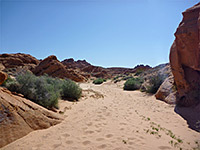 There are many roadside warning/advisory notices in Valley of Fire State Park, and the trailhead for Mouse's Tank is no exception, displaying signs about the dangers of the summer heat and the need to carry valuables due to a spate of vehicle break-ins. 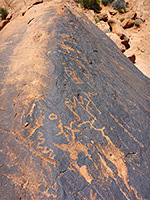 From the large parking area, the path enters the upper end of a shallow, sandy-floored wash bordered by low cliffs and slopes of Aztec sandstone, and soon passes the first of many petroglyph panels, all of which are on the northeast side. Some are instinct and hard to spot, while others are quite prominent. Most were carved into the black patina on the surface of the dark red sandstone, and often the etchings have themselves now been weathered so can be difficult to photograph, especially when the sun is shining strongly. 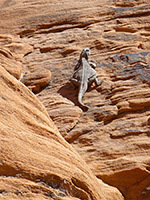 Lizards are abundant in the canyon, ranging from small whiptails to the larger, slow-moving chuckwallas. Mouse's Tank (actually a pair of potholes) is reached just after a bend in the canyon and isn't much to look at, especially when dry or filled with stagnant water. The canyon drops off beyond by about 20 feet, and the point is marked by a notice stating 'End of Trail 20 Yards'. The tank is named after a Paiute Indian who used the potholes as a water source when hiding in this area in the late 1890s. The continuation route down Fire Canyon Wash starts by climbing the slope on the left side of the tank then descending another slickrock face to the base of the dryfall below, where the canyon is now rather more enclosed than before. 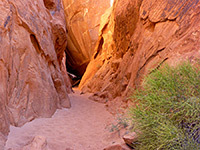 Following the streambed downstream, around a few bends, leads to a narrower, sheer-walled passageway filled with boulders, as the wash descends more steeply. 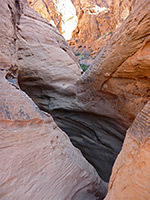 The canyon is blocked by a huge fallen rock at one point, but a small cavity underneath provides a way to continue, down to a hiker-built pile of stones. Some people may need a short rope to descend, if the stones have been washed away by floodwaters. The next obstruction, not far beyond, is a pour-off through a narrow gap, passed by climbing a short distance up the right side then down a ramp beyond. The wash opens out for the next half mile or so, the streambed now wide and covered by deep, soft sand, so walking becomes quite tiring. Several tributaries join from both sides and the main drainage is not always obvious, especially on the return journey. 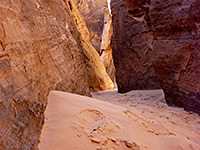 It enters a straight, moderately narrow passage between quite high cliffs and reaches the main obstacle, a deep drop-off into the most enclosed stretch of narrows, which is still relatively short, but needs a longer diversion to pass; up a cairned route on the right side, past a ravine, up some more to a ridge then down a little valley back to the streamway, which is now much less enclosed. The slot can then be viewed by walking upstream a way. Downstream, the canyon widens again, and the cliffs fade away completely once past a big dome on the south side, where the open, sandy wash bends southwards and continues another 1.5 miles to Highway 169.